Nina Powles is on the ten-person shortlist for Primers Volume Four. 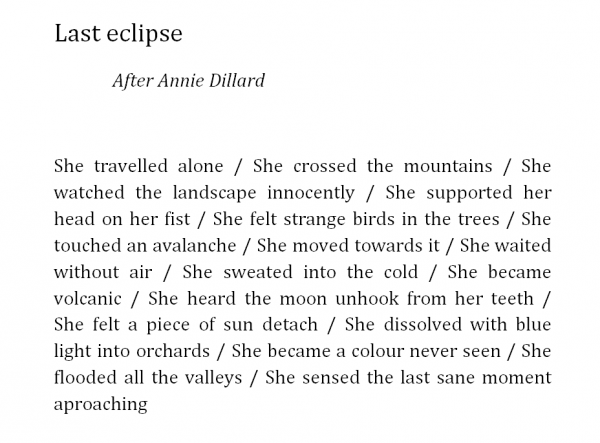 ‘Last eclipse’ is from her shortlisted manuscript Kōwhai Bloom. We’ll be showcasing the work of all the shortlisted writers over the next two weeks, so check back to read more poems. Nina Powles was born in Wellington, New Zealand and is half Malaysian-Chinese. She lives in London. A set of chapbooks titled Luminescent was published last year by Seraph Press, and her poems and essays have recently appeared in Poetry, Starling, gal-dem and Hotel. She was the 2018 winner of the Jane Martin Poetry Prize and is Poetry Editor at The Shanghai Literary Review.